In pCon.planner, materials give object surfaces the appearance of a particular raw material (e.g. glass, metal or wood). To simulate materials, pCon.planner uses the physical material model. This simulates what a material looks like when light meets its surface. A physically correct material has different ways of interacting with light: Light is reflected, refracted or absorbed. A material becomes visible to us because it reflects incident light. Furthermore, we are able to see materials that shed light by themselves. To read background information on the physical material model, please follow this link. pCon.planner displays complete materials in Realistic mode as well as render styles based on Realistic mode. Photo-realistic rendering also processes these materials. Other render styles do not display materials or only display simplified versions of them (e.g. in Shaded mode, color textures are displayed, but not Normal Maps). 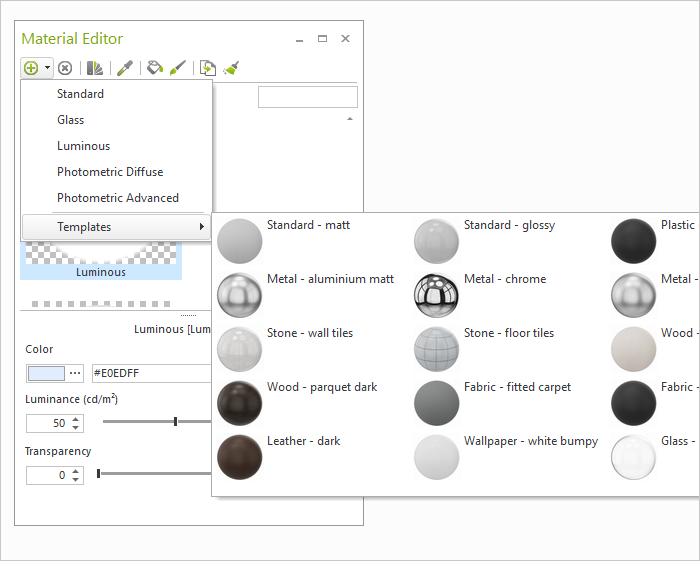 The Material Editor is the tool for displaying, creating, modifying and managing materials. It is opened from the Material Editor button in the Material group on the Edit tab or from the toolbar. 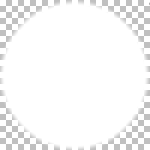 Create Standard Material: The small arrow to the right of the plus symbol will open a selection of material templates (see below). Select material template after clicking on the arrow: Generates a new standard material, glass or self-illuminating material. Delete an existing material: A deleted material can be restored using the Undo command (Quick Access toolbar). If the pipette is clicked onto an object in the design, its material will be selected in the Material Editor. The pipette is also used to sample the color from objects in the design. Sampling means that it will be automatically converted into a material in the Material Editor. 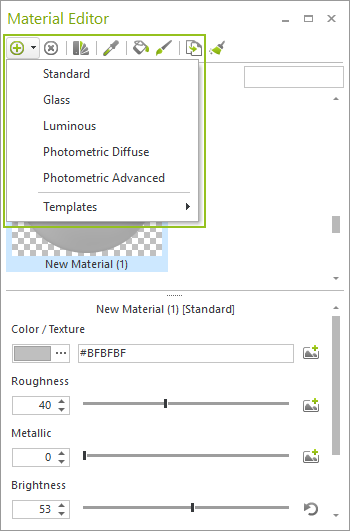 The material selected in the Material Editor can be assigned to a surface within the plan by clicking on it. In addition, you will also find the function Replace Material: Click on the paint bucket and then open the context menu (right click). This option will replace the material on the selected surface within the entire selection as well as all surfaces of the object that use the selected material. Assigning a material to a selected object: The objects will be completed coated with the material. Duplicating an existing material. For example, this function is useful for making a copy of write-protected materials so that they can be modified. Deleting all materials not assigned to objects. If unassigned materials should be retained, do not use the local function in the Material Editor. Instead, use the global Purge function in the Application Menu. Calling up the filter menu. Here you can search for materials by name or filter based on specific criteria. 1. Material is locked and cannot be edited. Click the lock icon on the material to unlock it. 2. Material is not assigned to an object in the plan. Click the broom icon to delete all unassigned materials in the planning. 3. Material is currently selected for editing. 4. Material is currently not selected. A right click on a material in the Material Browser will open a context menu. 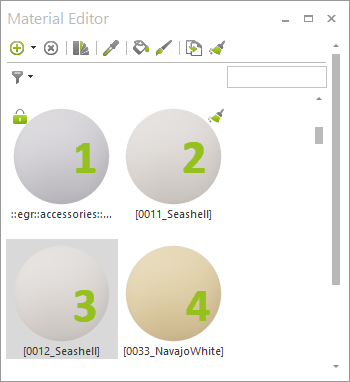 Select the objects in the design which use the material currently selected in the Material Browser. 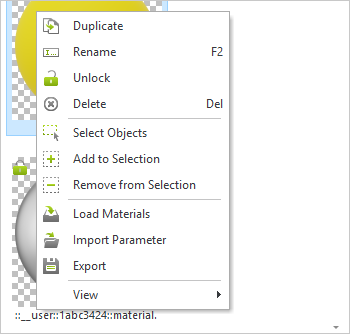 Extend the selection in the design to include those objects which are using the selected material. Remove objects with a chosen material from the selection. Load a material from a file. Import material parameters and replace the parameters of the active material with them. Export the material selected in Material Browser. pCon.planner’s physical rendering differentiates between the various material types. The interaction from light and material is controlled through the material properties. The selected material type influences the behavior of the light when interacting with the material. • The specular portion of the light is reflected directly at the surface. • Diffuse reflection is caused by the scattering of rays of light within the material: rays of light enter into the material and are deflected into different directions. • Metal materials only have specular reflection, non-metals reflect predominantly diffuse. • Depending on the properties of a material, the light rays enter deeper into the material. They are either passed through the material (transparency), thrown back within the material (translucency) or swallowed by the material (absorption). In addition, there are two other types of material: photometric diffuse and photometric advanced. These are relevant for the planning of lighting scenarios. A color or texture is the base of every material. • Materials that are based on a color use a HEX or RGB value to simulate the character of a certain material. • The color of a metal material defines intensity and color of its specular reflection. 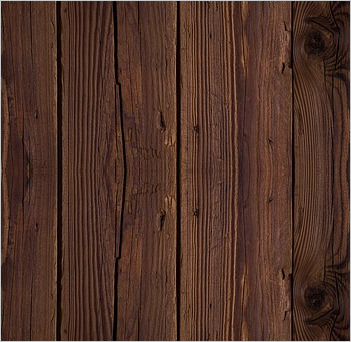 • Textured materials use an image (texture) to cre-ate the semblance of a surface structure. The tex-ture defines structure and color of a material. 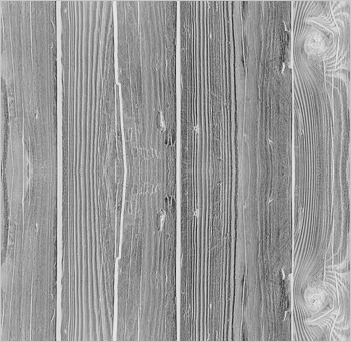 The degree of roughness defines how smooth or rough a surface looks. Depending on the roughness, the specular reflected light will be scattered more or less strongly. 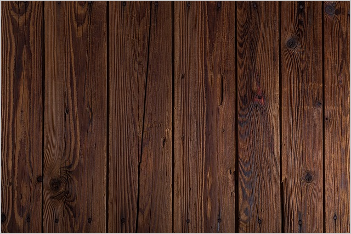 • 0% Roughness: Smooth and polished surface – sharp specular reflection. 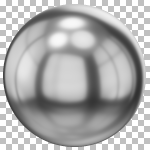 • 100% Roughness: Very rough and matt surface – blurry specular reflection. • If you want to create a material with different roughness areas, use a monochrome version of the texture. Light areas of the image will be matt, dark areas will be displayed as glossy. 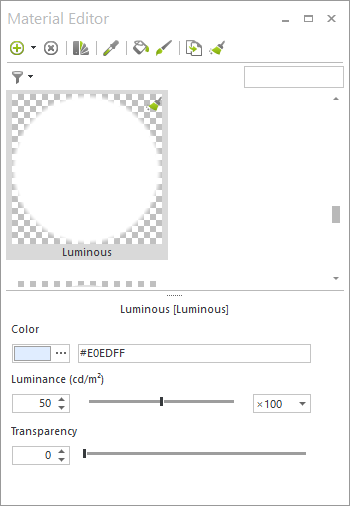 This parameter defines how light or dark the base color or texture of a material is. • 0% Brightness: The material does reflect only little light, it appears almost as black. • 100% Brightness: The material reflects strongly and appears almost as white. • The values on the scale define how intensive a color is or how distinct a texture appears. • A base texture can be brightened or darkened, a predefined color can be altered. • The brightness defines how strong the specular reflection of metal materials is. • Transparency determines what portion of rays of light passes through the material. 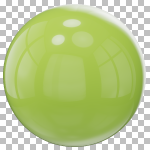 • For a standard material, values of 0% (not transparent) to 100% (completely transparent) are possible. 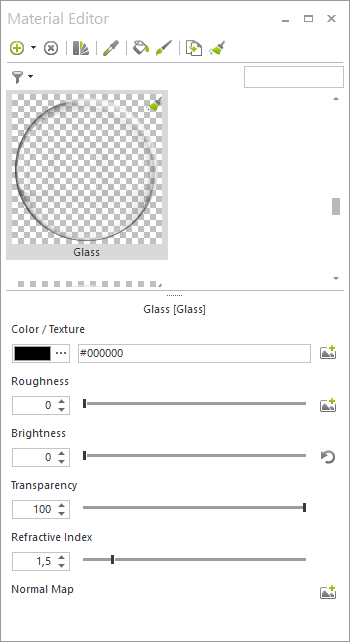 • Materials with a base texture as well as those with a base color can be assigned a transparency value. • Even if a glass material is nearly completely transparent (with a value approaching 100%), a slight specu-lar reflection will stay visible, preserving the gloss of the surface. • In the physical world, materials are either metallic or non-metallic. Therefore, the Metallic control should either be set to 0% or to 100%. • Intermediate values are used to simulate polluted metal or metalloids. • The metallic value can also be controlled via a map: Light image areas are marked as metal, dark areas are interpreted as non-metal. • Indicates how strong light rays are refracted when hitting a material. • Values range from 1 (no refraction of the incident rays of light, like in a vacuum) to 5 (very strong re-fraction). • Most materials are approximating a value of 1.5. • The refraction index defines the intensity of the specular reflection of glass materials. 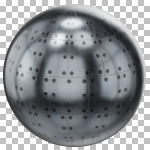 • You can add a Normal Map to a material. The normal map simulates the illumination of bumps and dents within a material. The next paragraph contains introduces you into the creation of maps. 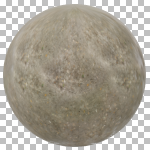 Use an external image editing program to derive a roughness map or a normal map from a texture. Pictured on the right is an image that has still to be reworked to function as a texture. If the texture is put together in tiles, the transitions should be invisible. In our example, we created seamless transitions by mirroring and copying parts of the image in an external image editing program. We recommend using high-definition scans of your materials or looking up premade textures on the internet. 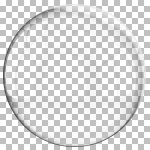 Please keep in mind that the texture should be seamless. In this case you can go without image editing. Click the icon in the Material Editor (Color/Texture area). 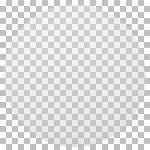 Select a texture from your local file system. 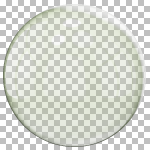 Save the texture under a new name to create an image containing roughness information. This Roughness Map uses greyscale. In our example, the map was created by inverting the texture and by resetting the saturation. • Light areas of the map are read as rough, dark areas will be displayed as smooth. • The darker an area, the glossier it gets. 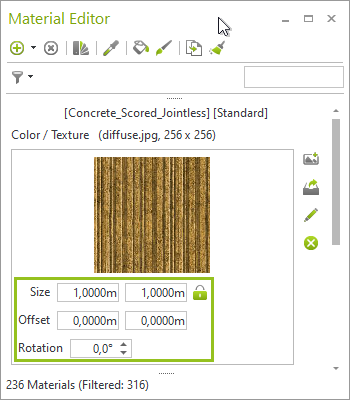 Click the icon in the Material Editor (Roughness area). Select a texture from your local file system. 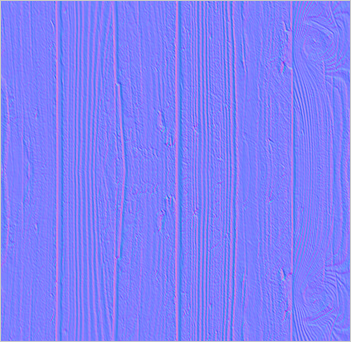 For the Normal Map, the areas of the texture are colored in an external program with RGB values to create a relief. 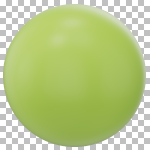 The relief of a normal map itself does not cast shadows, but makes individual pixels appear oriented differently. Click the icon in the Material Editor (Normal Map area). Select a texture from your local file system. For metal materials, the metal property can be controlled via a map: bright image areas get metal properties, dark ones are interpreted as non-metal. The Metallic Map is used, for example, on metal surfaces with rusty areas. 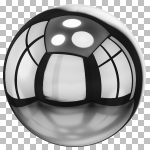 Click the icon in the Material Editor (Metallic area). Select a texture from your local file system. 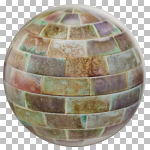 Color Texture and Normal Map have an area of placement. Here you can set Rotation, Width and Height (aspect ration can be locked or unlocked). Roughness and Metal Map are initially linked with the texture values: changes to the texture will be adopted to the maps. If you would like to adjust the position of the Normal Map independent of the texture, click on the pencil icon in the Normal Map area. Input fields will then be available, in which you can individually position the Normal Map. Luminous materials are based on a color as well as a lumi-nance. A transparency value can be assigned in addition. The shader automatically adds a blooming effect to lumi-nous materials. Blooming creates a soft glow in the direct environment of a luminous object. We recommend selecting one of the templates from the Material Editor: Click on the small arrow next to the plus symbol. In the drop-down menu, hold the mouse over the templates. An additional menu will open with various material templates. A huge variety of materials which you can use for your designs is provided in pCon.catalog. Clicking on the Materials catalog in the Catalogs group (Start tab) takes you to the world of materials of EasternGraphics. Note: Material templates from the material editor will be loaded in the material editor for further editing. Additionally, materials from the pCon.catalog can be assigned to an object directly after they are selected. There are several ways of assigning materials to objects. 1. Select the material from those in the Material Editor. 2. Then click on the paint bucket icon ( ). 3. Every time you click on an object in the design the material previously selected will be assigned to the object (end assignment process by pressing Esc or using Cancel in the context menu). 3. Open the Context Menu by right clicking. Select Replace Material. 4. Click on the surface where you would like to replace the material. This option will replace the material from the clicked surface within the entire selection as well as all object surfaces where the clicked material is used. 1. Mark the objects in the design to which you wish to assign a particular material. 2. Now click on the material you wish to assign (from the Material Browser). 3. On the toolbar, click the paintbrush icon ( ). The next thing that will happen is that the material will be assigned to the complete surface of the objects which were selected. 1. Click on the Material Transfer item in the Material group, Edit tab. 2. Now select the material in the design which you wish to assign to a further object by clicking on it. 3. The appearance of the cursor in the working area will change, in that the paint bucket becomes visible. Every time you click on an object in the design the material had previously selected will be assigned to the object. End the assignment process by pressing Esc or using Cancel in the context menu. 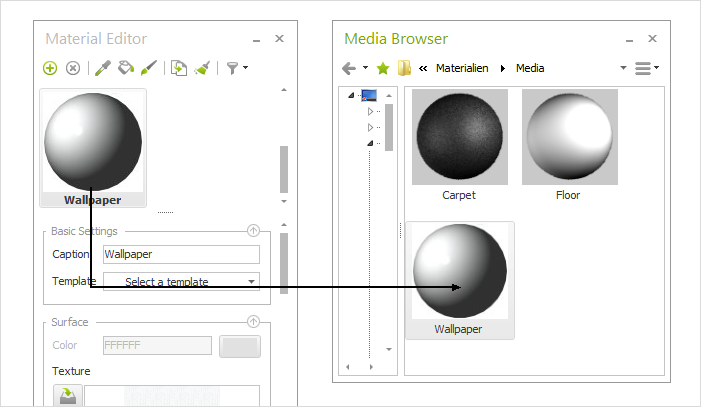 Materials can be assigned using Drag&Drop, either directly from the Material Editor, from the Media Browser or from the local system. The procedure is the same in each case. Below, there is an explanation of how to assign a material from the Material Browser. 1. In the Material Browser, click on the material you wish to assign to an object. Hold the mouse button down. 2. Drag the mouse (still holding the button down) onto the object to which the material is to be assigned. 3. Now release the mouse button. To save materials, you can either use the Export item in the context menu (see here) ore drag the material from the Material Browser and drop it into the Media Browser or into any directory of your system. Drag&Drop from Material Browser to Media Browser is illustrated in the next screenshot. It is possible to select several materials at a time (press Ctrl while selecting).